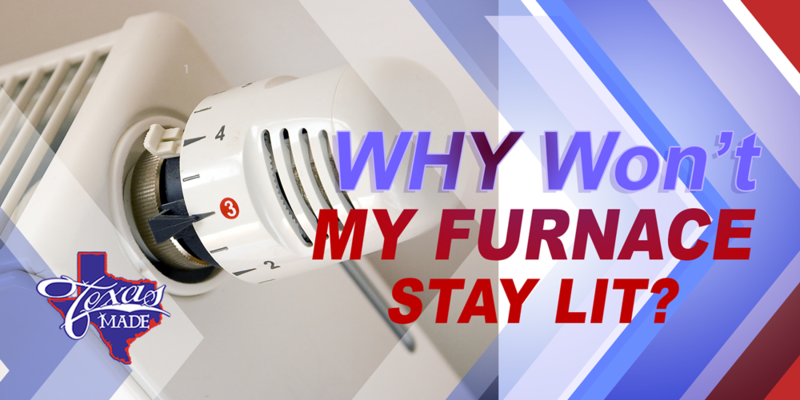 Why Won’t My Furnace Stay Lit? Posted on February 20, 2018 at 10:45 am. Bad Thermocouple. A thermocouple controls the gas valve that provides fuel to keep the flame burning and acts as a heat sensor at the same time. When the pilot light goes out, the thermocouple closes the gas valve to prevent the gas from leaking into your home. A malfunctioning thermocouple closes the gas valve even when the pilot is on, causing restriction and preventing the pilot light to stay lit. The heat sensor may become dirty also after some time and this dirt can affect the operation of your furnace. Burner Malfunction. The source of heat in your furnace is the burner and if it fails, there is no way to generate heat. A failing burner happens at lesser chance as compared to pilot light issues. This is commonly caused by blockage in the gas line which starves out the burner so ignition will not take place. Airflow restriction. Lack of proper airflow (mostly due to dirty filter) can cause your furnace to overheat. If this happens, the blower constantly runs to cool down the system and automatically reignite once it reaches the set temperature. If this continues however, the high limit control may fail and will not allow the furnace to reset. This time you may need a licensed professional to do the job. Pressure Switch. The pressure switch contains a tube coming off the draft inducer. This tube is usually blocked by spiders’ nests and other debris which cause the pressure switch to malfunction. Bad circuit board. If the problem lies in the circuit board, you need to call a licensed technician for help. Circuit boards have LED codes that provide indications of what is causing the problem. This is a more complicated issue and should not be done independently by homeowners with less knowledge and skill about the matter. If you need an emergency furnace repair in Granbury, TX or in nearby areas, do not hesitate to call the experts at Texas Made Air Conditioning and Heating.